^ Bill Casselman. 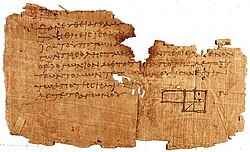 One of the Oldest Extant Diagrams from Euclid. University of British Columbia. [2008-09-26]. ^ Reid, D. A. & Knipping, C. (2010).Proof in Mathematics Education: Research, Learning, and Teaching Sense Publishers, p. 133. ^ 单壿. 《算两次》. 中国科学技术大学出版社. 2009. ISBN 7312024823. ^ Vinciane CAMBRÉSY-TANT，Dominique CAMBRÉSY，Stéphane CARPENTIER，''Autour du raisonnement par l'absurde''，IUFM Nord - Pas de Calais (PDF). [2014-01-11]. （原始内容 (PDF)存档于2013-12-28）. ^ THEODOR ESTERMANN，1975 (PDF). Blms.oxfordjournals.org. 2013-12-06 [2014-01-11]. ^ 苏淳. 《漫话数学归纳法》. 中国科学技术大学出版社. 2009. ISBN 7312024866. ^ The History and Concept of Mathematical Proof, Steven G. Krantz. 1. February 5, 2007 (PDF). [2014-01-11]. ^ 相信數學，或相信電腦. 中國科普博覽. 2004-04-29 [2014-01-14].